• The Art Fund has launched an appeal to have Yinka Shonibare’s Ship in a Bottle, currently sitting atop Trafalgar Square’s fourth plinth, relocated to a permanant home outside the National Maritime Museum in Greenwich. The fund, which has kick started the campaign with a £50,000 grant, needs £362,500 to buy the work – a scaled down replica of Nelson’s flagship, HMS Victory – which has been on display in Trafalgar Square since May, 2010, but is due to be removed in January next year. The replica work features 80 cannon and 37 sails, set as on a day of battle, and is made out of materials including oak, hardwood, brass, twine and canvas. For more, see www.artfund.org/ship/. • The historic ship HMS Belfast, moored on the Thames between London Bridge and Tower Bridge, has been closed until further notice after a section of gangway which provides access to the ship collapsed earlier this week. Two contractors received minor injuries in the collapse and staff and visitors were evacuated by boat. The HMS Belfast is described as the most significant surviving Royal Navy warship from World War II and later served in places like Korea. It contains extensive displays on what life was like aboard the vessel. Keep on eye on www.iwm.org.uk for more information. • Now On: Winter Wonderland in Hyde Park. Hyde Park’s annual festival of all things Christmas is on again and this year’s festive offerings include, an ice rink, circus, giant observation wheel, rides and the chance for younger people to visit Santa Land as well as a plethora of opportunities to purchase presents at the Angels Christmas Market and warm-up with some of the fare available at eateries including the Bavarian Village, English Food Fair, and Spiegel Saloon. Winter Wonderland is free to enter and open between 10am and 10pm daily. Runs until 3rd January. For more, see www.hydeparkwinterwonderland.com. OK, so it’s not exactly small but HMS Belfast – an offshoot of the Imperial War Museum moored permanently on the Thames near Tower Bridge – does make a fascinating museum in which to spend a few hours. Commissioned into the Royal Navy on 5th August, 1939 (just in time for the start of World War II), the HMS Belfast is a large light cruiser built, along with the HMS Edinburgh, as an improvement on the then existing ‘Southampton’ class vessels. It is now the only surviving example of the many big gun armoured warships which were built for the Royal Navy in first half of the twentieth century. Assigned to the Home Fleet on the outbreak of war, the ship operated out of Scapa Flow in the Orkney Isles in far north Scotland and was charged with patrolling the northern waters as part of efforts to impose a maritime blockade on Germany. Striking a mine in November of that year, however, it was put of out action until two years later when it rejoined the Home Fleet and then began escorting Arctic convoys to the Soviet Union – a mission which saw it take part in the Battle of North Cape off the Norwegian coast in late 1943 (this battle saw the sinking of the German battle cruiser Scharnhorst). The HMS Belfast later saw action on D-Day, the Allied invasion of Normandy in 6th June, 1944, when it was employed to bombard German positions onshore before, heading to Japan where, after the end of the war, it was used to evacuate survivors of prisoners-of-war and internment camps in China. 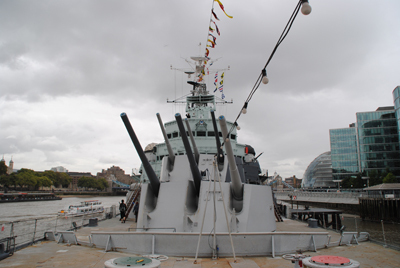 The HMS Belfast saw action in the Korean War and then spent further time in the Far East before – under threat of being disposed of and broken up – it was acquired as a museum and moored in London. The first visitors were admitted on Trafalgar Day, 1971, and, as of last year, nearly 10 million people have taken up the chance to look at the ship. These days there’s a well-defined route through the vessel, complete with audio guide (it’s included in the admission price), which takes visitors on an informative journey describing what life was like for those who served onboard the Belfast – including everything from the Arctic messdecks where ratings slept in hammocks to the NAAFI store where they could buy supplies, sick bay, the ‘modern’ laundry room, and chapel as well as the engine room, shell rooms and magazines, and , of course, the bridge. 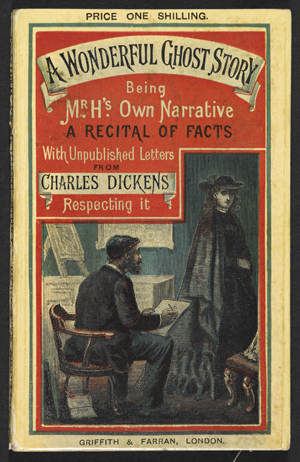 Many of the rooms have been set up – some using life-sized manniquins – to show how they would have looked during a typical day. Particularly worth a look is the new Gun Turret Experience: A Sailor’s Story 1943, an immersive film, light and sound show which gives a glimpse into what life was like working inside one of the six inch gun turrets. It can take a while to get around the whole ship (and parents are asked not to take small children into the boiler room) but it’s well worth taking the time to explore properly. In addition to the features of the ship itself, there are two exhibitions – one looking at the role of the ship in peace and war, and the other, an interactive experience in what life was like on board. WHERE: HMS Belfast is moored on the Thames between London Bridge and Tower Bridge. Entry is from the south bank of the Thames near Morgans Lane (nearest Tube stations are London Bridge, Tower Hill or Monument); WHEN: 10am-6pm (last admission 5pm) daily until 31st October, then 10am to 5pm (last admission 4pm); COST: £13.50 adults/£10.80 seniors and students/children under 16 free (price includes a voluntary donation); WEBSITE: http://hmsbelfast.iwm.org.uk. 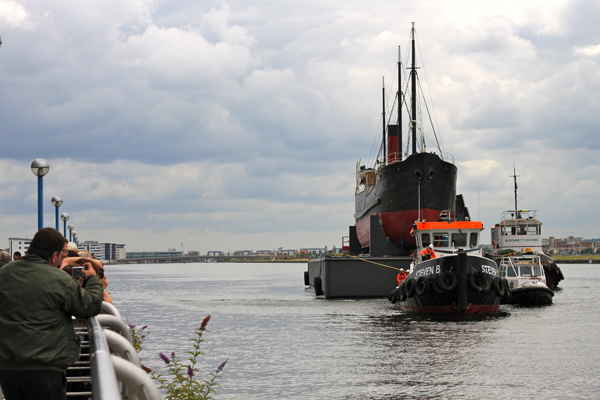 The SS Robin being towed to its new mooring in East London on a floating pontoon. PICTURE: James Spellane/SS Robin Trust. The world’s oldest complete steamship, the SS Robin, made a dramatic return to the Royal Docks in East London earlier this month. Built in 1890 at the Thames Ironworks shipyard on the River Lea, the coastal cargo steamer was operational for more than 80 years, initially around the coast of Britain and the English Channel and later in Spain where it bore the name Maria. The 300 tonne vessel has just been through a three year restoration project spearheaded by the SS Robin Trust. It has now taken up a temporary mooring on a new floating pontoon while final conservation work is completed. It is anticipated that the steamship – which is listed on the ‘Core Collection’ of the UK National Historic Ships Register meaning it’s seen as historically significant as London’s two other maritime landmarks, the Cutty Sark and HMS Belfast – will be opened to the public. For more information, see www.ssrobin.com. 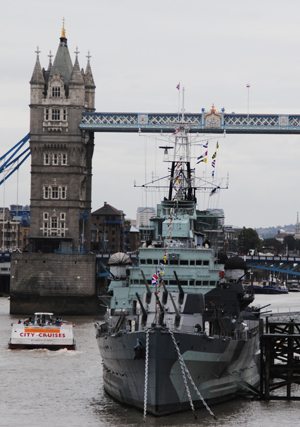 • The HMS Belfast’s newly restored masts were unveiled to the public this week following an 18 month restoration project. Moored on the Thames between Tower and London Bridges, the ship is one of only a few surviving Royal Navy ships that served in Arctic convoys supplying Russia during World War II. The restoration was carried out for free by a team of more than 20 men and women from the JSC Shipbuilding plant, Severnaya Verf, in St Petersburg, Russia as a tribute to the British and Allied sailors who risked their lives on the convoys. The work involved removed and replacing all of the masts. For more information, see http://hmsbelfast.iwm.org.uk. 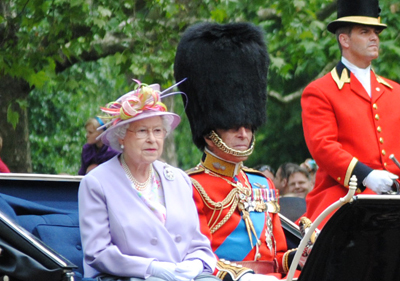 • A record 413,000 people visited Buckingham Palace over the summer – the highest number in 16 years. The record numbers were partly ascribed to the new Garden Cafe which served 46,000 cups of tea. Meanwhile, the palace has announced the exhibition, Victoria & Albert: Art & Love, at the Queen’s Gallery has been extended until 5th December. For more information, see www.royalcollection.org.uk. 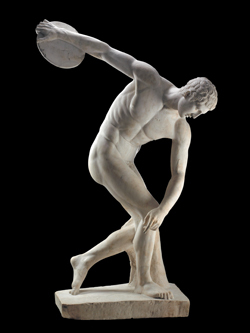 • The Worshipful Company of Plumbers has reportedly announced it will be installing a bronze statue of a plumbers’ apprentice outside Cannon Street station next year. The statue’s installation will mark 400 years since the company first received its Royal Charter from King James I. 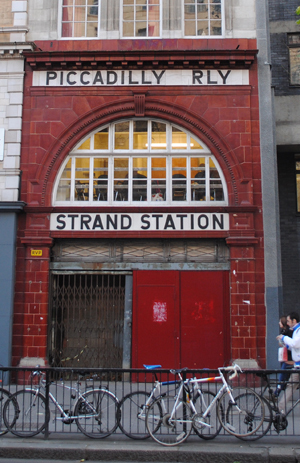 The station was the site of the company’s livery hall until 1863 when the site was compulsorily acquired to make way for the new railway.